The initial title for this post was “Customers expect a personalized experience,” but doesn’t that sound like ‘us versus them’? It sounds like customers want this, but I don’t. The reality is, we all want to be treated like an individual. We want the companies we do business with to value us as a person, not a number. And, it doesn’t just apply to customers. It’s also about employees, partners, investors, our community, etc. It was no surprise to see that personalization rose to the top when we asked customer experience professionals which changing customer expectation will have the greatest impact on business in the future. 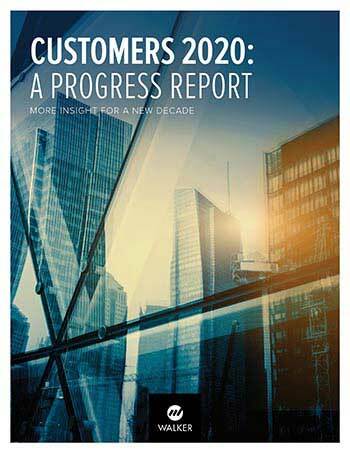 In fact, it’s the one expectation that is anticipated to grow the most between now and 2020. The problem is that for many firms the significant cost of personalization can be hard to justify. Offering a personalized experience requires a complete, integrated view of the customer, which is challenging for most and virtually unimaginable for large, multinational organizations. But, the challenge shouldn’t result in inaction. While data from Walker’s Customers 2020 study clearly shines a light on personalization, I very rarely (pretty much never) hear customer experience professionals say they are focused on personalization. I suspect what’s happening is we’re looking the other way. It’s kind of like the bystander effect – we all see a need, but we aren’t going to help. I think we look at personalization and think it’s someone else’s responsibility…it’s sales, marketing, account teams, product development, customer support, invoicing, etc. And, you’re right. It is the responsibility of all of those functions and more, which is why it’s the perfect challenge for customer experience professionals. To me, personalization is about humanizing the experience. It’s about showing care and concern for customers. And to do this, we need to have an intimate understanding of our customers individually and the companies they serve. Yes. Delivering a personalized experience can be a daunting task, but it fits squarely with the purpose of the customer experience team. Buyers are starting to pay attention to the role companies play in the world. They are starting to take note of companies that focus solely on bottom-line profits and those who focus on people and profits. It’s time we take on the challenge of personalization. Are you ready?